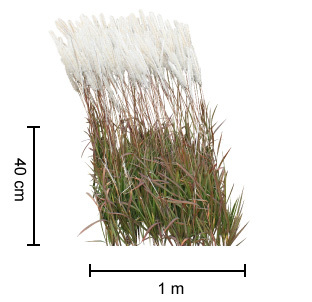 Description: Yalba™ Imperata gets reddish foliage in winter that contrasts with its stunning fluffy plumes that last up to 4 – 5 months, around April to August (to achieve this see care below). It’s up to 30 – 50% shorter than the common form, gets very dense and is great at outcompeting weeds. It will spread quickly, so it’s best to plant as a monoculture. Yalba™ Imperata locks up more carbon in soil than most grasses. Size: 40cm high x 1m wide. 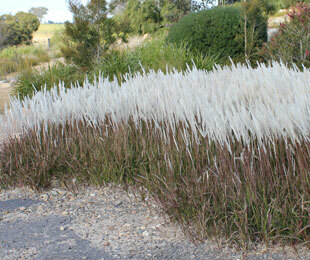 Uses: Ideal as a ground cover for roadsides, slopes, median strips. Not suited to garden planting as it will spread (needs to be contained by concrete borders). Position: Full sun to part shade. Yalba™ Imperata suits sandy to heavy clay soils. Extremely frost and drought tolerant, also tolerates humidity. Needs to be contained by a border. Care: No or low maintenance. Water as required for 8-13 weeks until established. 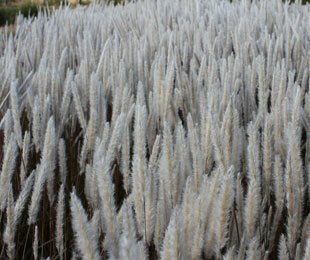 To achieve masses of white flower plumes trim or slash yearly late Feb-March. For more detailed information on Yalba™ Imperata click here.